Sober Look: Rotation out of money market funds - where is the cash going? Rotation out of money market funds - where is the cash going? 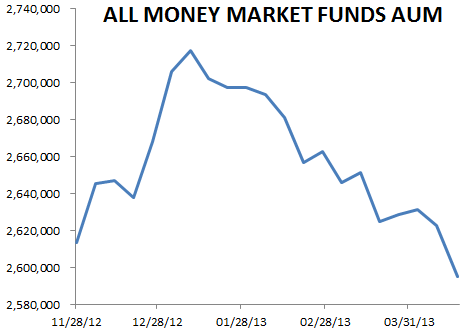 Investors are fleeing dollar-based money market funds. After the spike in cash holdings from taxable income "harvesting" at the end of 2012 (see discussion), the assets in money funds have declined sharply. What's causing this decline? The common explanation has been a major rotation into equities. That certainly explains some of it, but there is more to the story. Some institutional investors are becoming uneasy about the impending money market funds regulation. Not only are investors paid a near zero rate on their money market holdings, they also may be subject to some NAV fluctuations in the near future. Furthermore, the NAV fluctuations may only be applied to funds holding commercial paper and not to those holding just treasury bills or treasury repo. Reuters: - Two-tier money market fund reform is as clear as mud. The U.S. Securities and Exchange Commission is trying again to regulate these mutual funds, which compete with bank deposit accounts. But the rules could favor funds that invest in government debt over those buying corporate debt. The SEC isn't talking specifics, but Larry Fink, chief executive officer of BlackRock, is. He told analysts this week that some funds may have to adopt a floating net asset value (NAV) - a standard in the mutual fund industry but anathema to those running these accounts that invest in short-term debt. That's because investors, who view money market funds as higher-yielding savings accounts, could actually lose money if NAV is no longer pegged to $1 per share. But the scheme is the best option floated by regulators who want to stop 2008-like runs from happening again. It's simple and puts risk back where it belongs: on investors. But, according to Fink, it seems a floating NAV may not be applied to funds that invest in government debt like U.S. Treasuries. In a letter to regulators last December, BlackRock argued these funds, which represent 45 percent of the $2.5 trillion market, should be exempt. After all, they weren't part of the panic in 2008, which forced the government to bail out the industry with a blanket guarantee. It's not clear why there need to be two sets of rules for money market funds, other than the need to get a deal done. The effort to reform money market funds has been a long slog. And the SEC has already failed once to overhaul the industry. Compromise may be necessary, but it shouldn't come at the expense of sensible regulation. The whole attraction of money market funds has been the stability of principal. But with this type of regulatory risk, investors may be better off moving cash into short-term bond funds or ETFs. If one is going to be subject to volatility, why not hold money in something like the PIMCO Enhanced Short Maturity Strategy ETF (MINT), yielding 75bp. That's in contrast to PIMCO's Institutional Money Market Fund (PMIXX) which pays precisely zero, while its NAV may drop below par. Not surprisingly, that's precisely what investors have been doing. 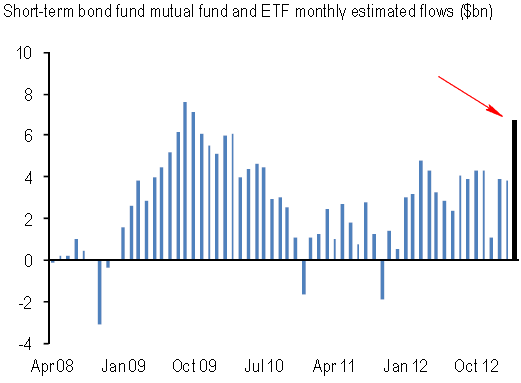 In March short-term bond mutual funds and ETFs have clocked the largest inflow since 2009. One unintended consequence of this shift to bond funds will be perturbations in some measures of money supply. Money market funds traditionally have been included in certain broad measures of money stock (such as MZM) while bond funds have not. The definition of "cash equivalents" have now been blurred further. Just watch certain high-profile economists in the next few months mistakenly interpreting this "rotation" as a slowdown in the growth of US money supply.